Thank you CleverMade for sponsoring this post. As always all thoughts an opinions are 100% my own. The pool and beach are in my near future and I’m SUPER pumped about that. 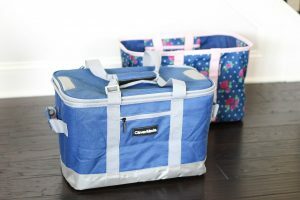 I wanted to share some really cool baskets and coolers that you will need this summer. And honestly, you should have them in general. CleverMade (and the name really says it all) has some gorgeous and genius products. I own and love my Lola Snap Basket and the Snap Basket Cooler. Since they easily and quickly pop open and snap in place on the sides it’s super easy to store them in your car. Then pop them open when needed. For example, grocery store runs. If you don’t want grocery bags rolling around in the back, just pop open your Snap Basket. Going somewhere a littler further? When I run to Coscto I like bringing my Snap Basket Cooler to keep the cold stuff chilled on the way home. Back to the pool and back talk. These bags are PERFECT for the summer. I have the limited edition Lola Snap Basket. It holds 30 Liters and up to 30 pounds… I need durable and that’s durable. 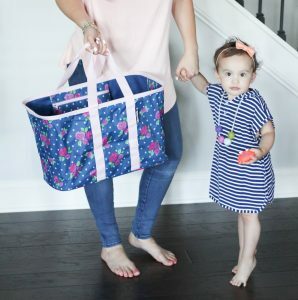 I’m obsessed with how these baskets fold down flat to less than 1.5″ and neatly stay with the built-in WrapStrap™. The CleverMade Snap Basket Cooler is perfect for road trips, beaches, pools, grocery store runs or keeping your drinks cool at a bring your own beverage party. There is even a bottle opener attached to the handle. The cooler rocks because it keeps iced beverages cool for 36 hours! It hold up to 50 cans plus ice, just so you can visualize how much goes inside. There are easy snaps on each side that pop to fold and pop up to hold the bag up and open. I seriously takes seconds to open and seconds to close up. They fold up nice and small, so storage is not an issue. 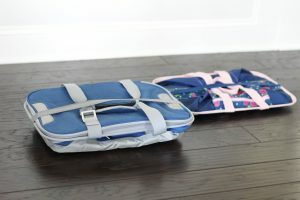 The elastic strap holds everyone in place neatly when storing. 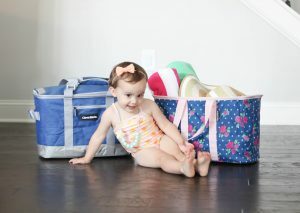 Izzy is ready to rock this pool and beach season! Check out CleverMade, you will find so many more products than the two I’m reviewing for you. I’ve been so pleased with their products, I think I’ll be on a mission to try them all! These sound amazing! Totally need for the beach! I love the floral print of the basket! I need that one! Need these for everything in my life apparently! Love how easily you can store them and how nice they look. These look awesome!! I need these in my life! You totally do! Everyone does! okay, i legit need these for the grocery story! OMG!!! I need this basket! Perfect to keep in the car! I can’t get over how awesome these are!